Home / Unlabelled / Celebrate A Summer of Fun and Learning with Green Kid Crafts! Celebrate A Summer of Fun and Learning with Green Kid Crafts! This summer, keep kids’ minds stimulated–and combat summer brain drain–with Green Kid Crafts' new Summer Discovery Series! These fun, educational activity kits point the way to a summer full of creative learning and outdoor summer fun. Each month, you’ll receive a new Discovery Box full of engaging summer-friendly science and creative activities, each introducing a different educational theme. 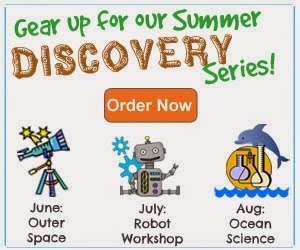 Join the Summer Discovery Series for a whole season’s worth of fun while you experience and study outer space in June, learn about and construct robots in July, and experiment with ocean science in August! You can learn more about all the Summer Discovery Series boxes here: http://www.greenkidcrafts.com/summer-discovery-series/. And, for a limited time, you can now get up to 3 months of Discovery Boxes for free from Green Kid Crafts! Act fast to snag up to $65 off! Right now if you sign up for a 6 month subscription and use the coupon ONEFREE, you will get 1 FREE month. That means you will pay $15.50/month! When you sign up for a 12 month subscription and use the coupon THREEFREE, you will get 3 FREE months. That means you will pay $15.00/month! This is a great time for current subscribers to renew for a year and for new subscribers to sign up! . Green Kid Crafts' award-winning Discovery Boxes pack a lot of fun and learning into convenient packages. Each box contains 4-6 Creativity and STEM Science Kits, extension activities, and free online extras. Projects are designed for ages 3-10. Offers expire May 20, 2015. My kids love crafts, so this would go over really big with them. This sounds like a great way to fend off some of that Summer Slide! I know my girls would especially love the August series! My kids would love these boxes. I'll have to check this out for them. That's really cool! Summer break is right around the corner and keeping kids mind's fresh with information they'll need to remember or might learn the coming year is great. Summer break is closing in and it's going to be a ton of fun; I'm really looking forward to it! This sounds like a fun way to keep the kids busy this summer. A few weeks in and im usually out of ideas to keep the kids busy. I'll be checking this out. My kids always need activities to keep busy in the summer. This is a super box to sign up for! Sounds very much fun and interesting classes to keep kids active during the summer break. My kids love craft works. I really love the packages offered here as well. Will definitely check this out to sign up for my girls. I'm always on the look out on what we could do at home during the summer. These boxes are a great idea.